The name Roche Bobois is synonymous with quality and style, its position in the luxury furniture market as strong as ever, so the company’s 50th anniversary was the perfect moment to launch its latest manifesto: The 10 Commandments of Design. Enlisting the assistance of France’s bad boy of design, Jean-Paul Gaultier, the 50th anniversary collection is a genuinely stunning blend of a classic furniture brand’s coming together with one of the main players in 21st century fashion. Roche Bobois has a long history of working with designers from the world of haute couture, Emanuel Ungaro and Kenzo Takada being just two of the major names to be associated with this illustrious furniture company. One of the enduring traits of Roche Bobois has been the fact that it’s never been afraid to embrace new ideas, which probably accounts at least in part for its success and longevity. Jean-Paul Gaultier started his career with a carefully cultivated reputation as high fashion’s clown prince, but with the passing of the years he has been embraced as a truly original creator of some of Europe’s most striking and unique fashion. From imagining Madonna’s iconic coned bra, which became the lasting image of her 1990 Blonde Ambition tour and clothing arch Goth Marilyn Manson for his Golden Age of Grotesque album, to creating the entire wardrobe of films such as Luc Besson’s The Fifth Element and Peter Greenaway’s The Cook, The Thief, His Wife & Her Lover, Gaultier has clearly taken Oscar Wilde’s maxim to heart: “The only thing worse than being talked about is not being talked about.” The populace of New York was certainly talking about him when his exhibition at the Metropolitan Museum of Art, entitled Bravehearts – Men in Skirts, featured just that. So, combine a classic furniture company and a controversial designer and what emerges? 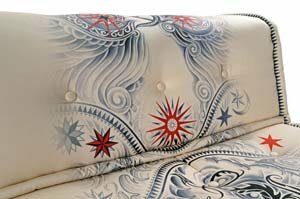 While trademark Gaultier touches are evident (this is a designer for whom playfulness and humour are always key) this in no way detracts from the classic Roche Bobois lines. 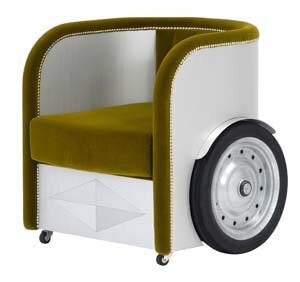 One of the most entertaining furniture pieces is the Ben Hur chair, a laminated aluminium structure with a velvet-upholstered seat that is available in red, green, blue and yellow; the Ben Hur reference is justified by the wheels fitted to either side of the chair’s rear that evoke that film’s famous chariot race. Wheels also feature as part of the Devil mirror, a mobile dressing mirror that has been created to appear like part of a porter’s trolley. Gaultier is renowned for his sense of fun, but Roche Bobois is equally famous for its problem solving abilities: combine them and you have two new lush, Gaultier upholstered versions of the perennially popular Mah Jong modular sofa. The Suitcases collection is a limited edition version of a classic chest of drawers and storage unit. Comprising saddle-stitched and leather-upholstered cases, this is pure Gaultier – a perfect marriage of humour and utility. The sideboard is something of a classical concept, but if anyone can rejuvenate the reputation of this stalwart of the dining room it is Jean-Paul Gaultier. The Papillon sideboard’s cunning design allows for maximum storage space while providing an outlet for that trademark quirkiness; the doors swing up when opening, giving this piece of furniture the appearance of a butterfly. The bedroom should always be a place of rest, but there’s a chance to combine the two with the bed and screen combination. Gaultier’s playful side takes a backseat to the requirements of the user. The screen folds around the head of the bed, providing a feeling of security. Many of these pieces of furniture are limited editions, their place in the history of domestic design virtually guaranteed by the illustrious marques of Roche Bobois and everyone’s favourite matelot, Jean-Paul Gaultier. If you would like to read more about Jean Paul Gaultier view here. This entry was posted on Tuesday, July 19th, 2011 at 3:20 pm	and is filed under Art, Design. You can follow any responses to this entry through the RSS 2.0 feed. Both comments and pings are currently closed.